Listed among the New 7 Wonders of the World as well as the UNESCO World Heritage Site, Machu Picchu is an Inca archaeological site located in the Urubamba Valley in Peru. One of the most popular ways to get there is, for instance, the Inca Trail, undoubtedly beautiful but also very expensive. Therefore, just as many other backpackers, we decide to opt for a cheaper way using local buses and listening to local people suggestions. First of all, we need to buy the entry ticket to Machu Picchu (plus the entry to the surrounding mountains) well in advance at the Cusco Tourist Office. We pay 72 Soles (about 21 euros) for Machu Picchu + Montaña Picchu entry, student rate. We start the journey from Cusco heading to Hidroelectrica for around 20 euros round-trip by a minivan. We leave at 8 am and after 6 hours of a tiring journey between endless curves, we reach Hidroelectrica in the early afternoon. From here we continue walking for about 2 and a half hours, following partly the train rails and partly a path in the woods. We finally reach the village of Agua Calientes, located just few hundred metres from Machu Picchu Pueblo. The latter is a small town at the foot of the mountain offering a wide choice in terms of accommodation and restaurants. Indeed we sleep in a hostel paying about €12 for a double room and we eat for about €3.50. The menu of the day usually includes boiled potatoes, meat/fish with salad or plain rice and even a chocolate pancake for dessert if you’re lucky. We set the alarm at 4 am but we both turn to the other side of the bed. Less than 1 hour later we suddenly realize that the long-awaited day is finally here and we must wake up!! We start to ascend the mountain at 5 am equipped with flashlights and good will. We take approximately 30 minutes to get to the passport and ticket controls. From now on the way that we face is an uphill road full of Inca stairs not easy at all. We finally reach Machu Picchu at 7 in the morning, reaching an elevation of 2430 metres. At this time the cloudy sky begins to make room for a breath-taking view. However, we immediately begin the ascent to Montaña Picchu whose peak is at 3061metres. The entrance here is allowed from 7 am to 11 am only if you purchase the entry ticket in advance. The previous climb is nothing compared with this one. All the trail is very narrow and steep, full of slippery stairs. It truly is a personal challenge! Moreover, we suggest bringing with you some medication for altitude sickness in case you suffer from it. 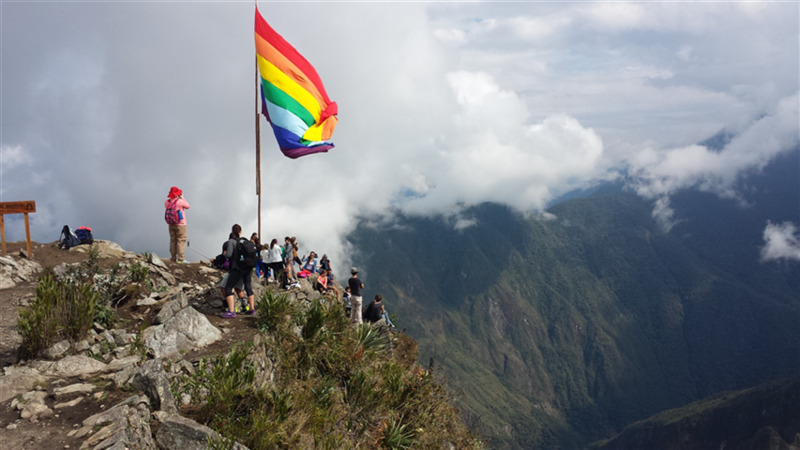 We hike for around 1½ - 2 hours (it depends then on your pace) to reach the summit of Montaña Picchu. A great deal of effort paid back by stunning views over the ruins and the river valley; we are surrounded by high mountains and a thunderous silence only broken by the immense beauty of the Inca empire at the bottom. We come back to Machu Picchu Pueblo by bus since we need to be at Hidroelectrica in the early afternoon. Therefore, we walk for about 2 ½ hours in order to come back to the starting point where the minivan was waiting for us. Finally, we arrive in Cusco late in the evening, really tired but satisfied as well! And what’s better than ending this wonderful day with a beer pong competition at our Loki hostel? Definitely one of the most exciting and challenging trails ever, beyond any expectation. Destination to be absolutely included on your bucket list!